HE-HA : Redzuan Abdul Rahim (left) was a brilliant Donkey at a recent rehearsal opposite Christian Clarno as Shrek. Shrek, the Musical is one of those rare productions that just might please everyone. It’s a musical for people who say they don’t like musicals. Its film- and theater-literacy made it gratifying for Broadway audiences, but it brings plenty of delightful fart jokes into the mix, too, in case all that other stuff isn’t your bag. And best of all, it’s family-friendly without feeling weirdly neutered—the sort of show an adult could attend alone without being given a dirty look. On top of all of this, Shrek, the Musical is completely fresh. Aside from its Broadway run and subsequent tour, the stage version of the DreamWorks film has hardly been performed anywhere—and that makes Kelrik Productions, which will stage the show later this month at the Spanos Theatre, one the first. Helmed by Kelrik Artistic Director Erik Austin, Shrek, the Musical opens Friday, July 12, and plays for two weekends—a helluva long run for a local show in a rented venue, especially one the size of the Spanos Theatre. But this show’s special—and not only because, given the local theater company’s recent loss of a venue, it’s the last Kelrik production for what may be a while. Fittingly, Shrek looks to be especially ambitious; its characters include a 32-foot dragon puppet built locally by Ethereal FX, the operation of which requires no fewer than six puppeteers. (More on that in a moment.) But Shrek is also special because its leads feel right. The production stars Christian Clarno in the title role, opposite Tabitha Skanes as Princess Fiona and the elastically expressive Redzuan Abdul Rahim as Donkey, a character originally voiced by Eddie Murphy. A trio such as Shrek, Fiona, and Donkey requires a certain level of offstage camaraderie. This, at a recent rehearsal, didn’t seem to be a problem. The premise of Shrek is simple. The titular ogre finds his swamp overrun by fairytale creatures the evil, obsessive Lord Farquaad (played by Austin) has banished from his kingdom. Annoyed at the intrusion, Shrek sets off for Farquaad’s palace to settle the situation. When he arrives, however, Farquaad is holding a tournament, the “winner” of which will have the privilege of attempting to rescue Princess Fiona from a castle protected by a fire-breathing dragon and bring her to Farquaad to marry. When Shrek wins the tournament, Farquaad promises to remove the fairytale creatures from his beloved swamp if the ogre can successfully rescue the princess. Clarno, who’s previously starred as Daddy Warbucks in Annie, Brian in Avenue Q, the sultan in Aladdin, and King Triton in The Little Mermaid, is a great physical match for the role. The challenge seems to lie in finding the ogre within, a task Clarno takes seriously. 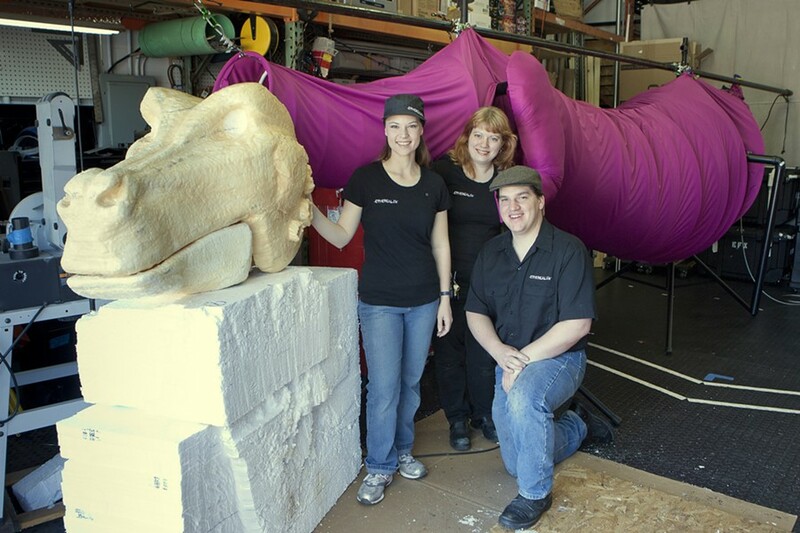 DRAGON IN PROGRESS : MJ Johnson, Jessi Brown, and Robyn Burns from Ethereal FX are pictured with their 32-foot dragon puppet in the making. When finished, the puppet will weigh 75 pounds and take six actors to operate. Shrek’s mission becomes more complicated when he begins to fall in love with the princess, who, unbeknownst to him, has a curious quirk: until she finds true love, she’s cursed to transform into an ogre after sundown. Skanes seemed to enjoy playing with her character’s duality. Skanes, who played Kate Monster in Avenue Q, has a rare gift for playing high-voiced girly characters without being grating or falling into cliché. Her Fiona appears at first extremely feminine and nauseatingly romantic, but Skanes gradually lets the ogre come through, barking out lines with a sudden gruffness that catches everyone off guard. I’M A BELIEVER: Shrek, the Musical, directed by Erik Austin, with book and lyrics by David Lindsay-Abaire, plays July 12 to 21 at Spanos Theatre at 1 Grand Ave. on the Cal Poly campus. Opportunities to donate to Big Brothers Big Sisters will be available through the Kelrik Cares program. Tickets cost $35; visit pacslo.org. Remember the 32-foot dragon puppet I mentioned? When I visited Robyn Burns, Jessi Brown, and MJ Johnson at Ethereal FX, Dragon lurked half finished in the warehouse space, her enormous reptilian head resting on blocks of Styrofoam. The puppet, Burns said, weighs around 75 pounds—just a little heavier than the dragon puppet used in the Broadway production. The Broadway puppet, he explained, was designed for professional puppeteers; the added heft of his version allows for greater durability, allowing for a few bumps here and there. Dragon’s body is easily collapsible, a must for a venue with little wing space; a row of hoops covered in purple “skin” can be quickly expanded or folded down. Brown did the sewing, while Johnson was responsible for sculpting the dragon’s elegant head—which was done freehand, combining the look of a horse’s muzzle and a reptile’s eyes. When finished, he said, Dragon will be fully operational—able to flutter her eyelashes at Donkey’s flirtation and open her jaw wide enough to (spoiler alert?) chomp satisfyingly down on Lord Farquaad. The relative newness of Shrek as a stage production means that many of the costumes, too, must be made by hand. Though much of the production’s wardrobe is courtesy of Costume Capers, several items—such as those for Shrek, Donkey, and Fiona—came from the imagination of costume designer Kathleen Forster. The show’s choreography, though inspired by the Broadway production, is also fresh. Longtime Kelrik regular Joe Ogren choreographed the majority of the 19 musical numbers on the program. Ogren—home for the summer from New York City, where he’s studying musical theater at Pace University—seemed to be enjoying the comparatively relaxed atmosphere of a Kelrik production. Ogren’s work shines in “Welcome to Duloc”—the musical number that introduces Lord Farquaad and his neurotic little town, spoofing several dance styles in the process—and in “Freak Flag,” in which the fairytale creatures embrace their differences and band together. The latter is one of director Austin’s favorite numbers. Given his many tasks at the moment—running the company, directing Shrek, doing a Beauty and the Beast summer camp for kids, and scooting around on his knees as the diminutive Lord Farquaad—Austin was understandably tired. Following Shrek, however, Kelrik will take a break from staging shows while Austin searches for a new home base for the company. While excited about Shrek, the director doesn’t conceal his exhaustion, either. “I am so ready for the break,” he sighed. Arts Editor Anna Weltner can belch the headline of this story. Contact her at aweltner@newtimesslo.com.